The BHP452 boasts a Makita-built, 4-pole maximum torque motor that delivers 450 in./lbs. of torque in a lightweight body. Its Shift-Lock drive system sleeve quickly shifts from "hammer drill" to "driver" mode for swift shifting between projects with less downtime, and the 2-speed design (0-400/0-1500) covers a wide range of drilling and driving applications. This drill/driver's compact design is only 9-1/2 inches long and weighs just 3.9 pounds, so it won't weigh down your wrist and it's easy to use for long stretches of time. There's even a trigger-forward built-in LED light for a helpful touch of extra light in dark corners. 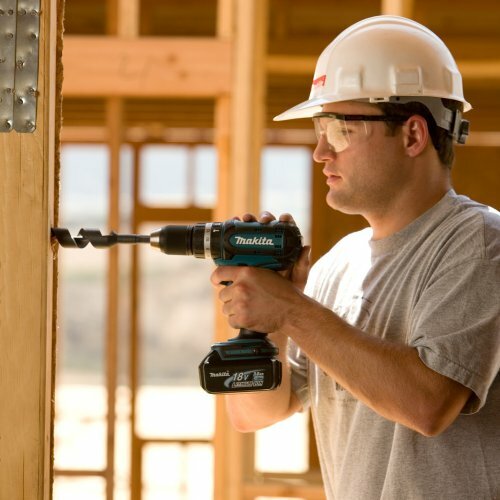 The BTD140 impact driver is stocked with a Makita-built, 4-pole maximum torque motor that delivers 1,280 in./lbs. of efficient torque in a compact design that's only 5-3/4 inches long. This driver's ergonomic shape fits like a glove and weighs just 3.3 pounds, for less operator fatigue and better control. This advanced, efficient driver also features a built-in LED light to let you see into all those narrow, dark corners, plus an electric brake for immediate stops and minimized kickback. Its two-piece armature and field, combined with externally accessible brushes, mean easy serviceability and a longer motor life. The BJR182 reciprocating saw comes standard with a Makita-built, D35 high-torque motor that delivers 50-percent faster cutting, with a 1-1/8-inch stroke that cuts at a speed of 2900 SPM. This saw's compact design is only 17-3/4 inches long and weighs just 8.1 pounds, so it's easy to use and control -- even for long periods of time -- and its ergonomic shape fits your palm like a glove. This versatile saw offers one-handed, fast and tool-less blade changes and shoe adjustments, plus a two-piece armature and field and externally accessible brushes for simple serviceability and longer motor life. The BML185 flashlight produces a high-illumination beam that emits high power at 4,500 lux. The Xenon bulb creates extraordinary brightness with the help of the LXT lithium-ion battery. This light boasts a compact design that's only 11-1/8 inches long and weighs less than a pound. 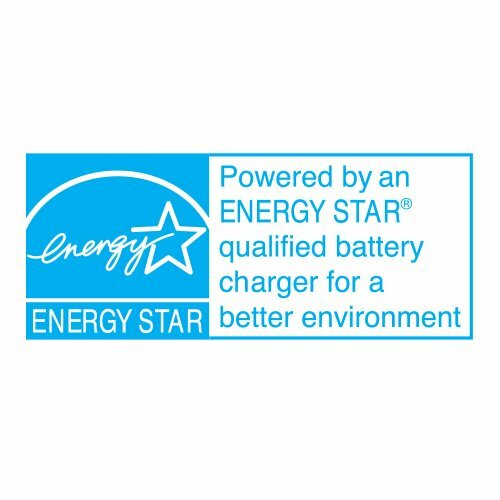 The power tools in this collection are all covered by a three-year warranty, and the batteries are covered by a one-year warranty. 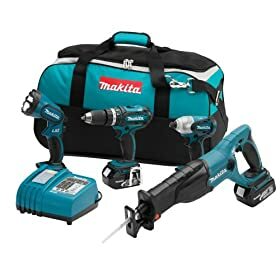 Makita hammer drill/driver with a tool belt hook; impact driver; reciprocating saw with blades; flashlight with 2 Xenon bulbs and a shoulder strap; 2 LXT lithium-ion batteries; 30-minute charger; contractor's bag. My son in law is an electrician with hundreds of pounds of tools, but he was impressed with my new Makita combo. He found the bag a bit flashy, but I'm not a professional and I think the bag looks great. However, it is the tools that are important. 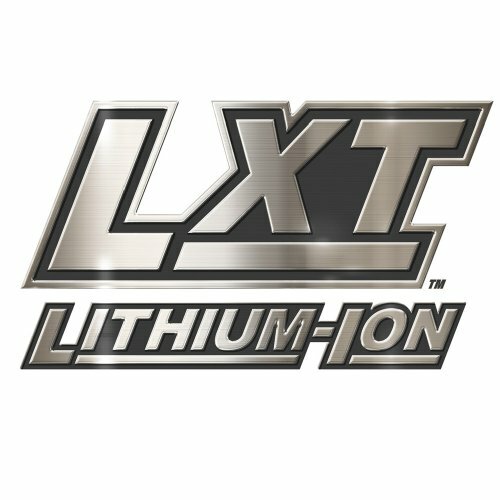 It was worth getting LXT's smaller, more powerful batteries; they last longer on a job and weigh less, which is important to someone my age. The impact driver looks small but there is nothing small about its performance; it really drives! I like it so much I've neglected the hammer drill, but expect it to be just as powerful when I need it. The reciprocating saw isn't light and it isn't a sissy. It sliced through steel unistrut like butter. The charger is first rate too. I haven't used the light yet, but I know how handy it will be when the light begins to fade before the work is done. Lithum ion holds a charge so well that the factory carge is still in tact! I have used these tools for about 60 work minutes now, I can't wait to see how long these batteries last on a full charge! love the power! I tried the new milwaukee lithium impact driver, the bit kept bouncing out of the screws before I was even close to being done, the makita has the perfect blend of balance & bower. recipricating saw? what more can be said! I think it's lame to count the flashlight as a tool, but I guess you get what you get. hey over all great product! This is the best drill set I have ever used. The drill itself is really solid and comfortable. 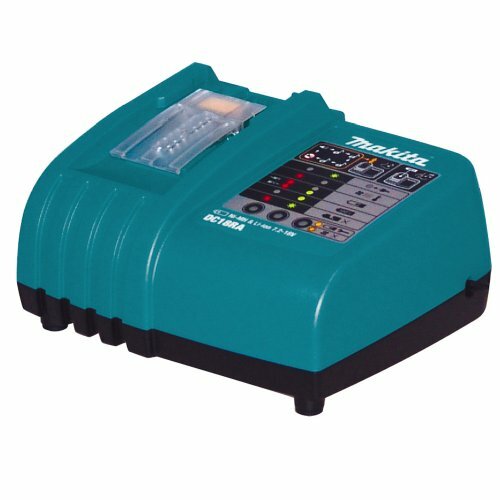 This is my third Makita set and it is by far the best. The saw is very easy to change blades, no tools and it only takes a twist of your fingers, very, very nice. The impact driver is something I cant believe i ever went without, It makes easy work out of three and a half inch drywall screws. The only thing that bothered me with the set is that the drill did not come with a clip to hold a bit, just a clip to hold the drill itself on your belt. This piece dont cost much but should have been included. Do your self a favor and get this set, you will probably kick your self later if you dont. I bought the kit from Home Depot when it first came out 3 years ago. As a kit, it's a solid performer. If I were to rate the individual products, I would have to say impact driver and the drill are exceptional...wouldn't trade them for any other. The LED was a really nice addition to these tools. I've had to use them in my attic a few times and the LED lights have proven invaluable. Both have exceptional torque and battery life is good. The belt clip is another of my favorite features. Since it's flat, I simply slip them over the edge of my pocket and they never fall off...best belt clip design I've used. My kit also came with the circular saw. Both the circular saw and the reciprocating saw could use a little more power. The circular saw seems to drain the battery too fast and the recipro. cuts nails fine but struggles with wood cuts. I don't know if the problem is with the battery or the saws themselves. I still use them but only for very small jobs. The flashlight works great and seems to be fairly tough. I've dropped it from as high as 6 ft. on a few occasions and it has not broken yet. It's replaced my other flashlights for general use. It's bright enough to be used as a spotlight in my boat. At the time I purchased this kit I also looked at the DeWalt tools...which were less expensive. I didn't like the heavier weight of the DeWalt batteries so I went with Makita. I'm still pleased with my purchase. I love this set. Plenty of power, lighter than my bosch 14.4v set. Quick charge. Long life batteries(way longer than my bosch set). This has worked great for me. I'm a builder & use it daily. No problems yet(1 yr). I added the 6 1/4 skill saw & love that too. I do alot of early onsite(before powers in) work. Drain pipe, underslab plumbing, footing pads...and alot of punchlist, going somewhere to do a few little things w/ min. set up. This works great for that too. This has been the best cordless set I've ever owned. good combo kit everything works well i us it every day on the job.i never had a problem with it yet. Outstanding set of tools! The drill and impact driver have plenty of power and torque. The batteries charge quick. I have not used the saw, yet. Looking forward to big project for the real test. Can not beat the price! Excellent Toolkit! Owner for 6 months and still happy! I love this combo kit! I have owned this kit nor for about 6 months and used them in every home improvement project to date. 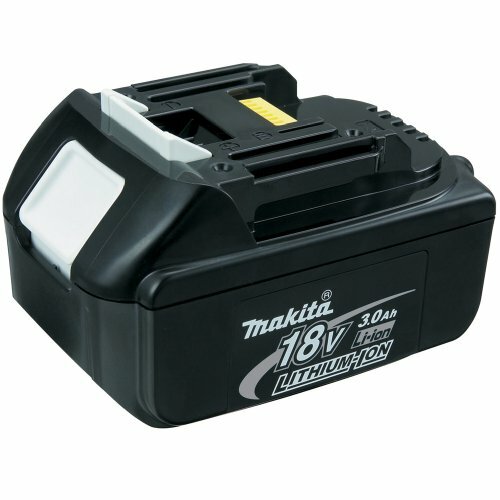 The 18V LXT battery life is excellent and tools are rugged and durable. I have found that the Reciprocating Saw does drain the battery faster than any of the other tools, but that is to be expected. The white LED is a nice touch to help illuminate the work area, but could use improvement. The drill chuck casts a shadow directly on the target area, so it seems the placement of the LED could have been positioned in a better place to reduce this minor annoyance. 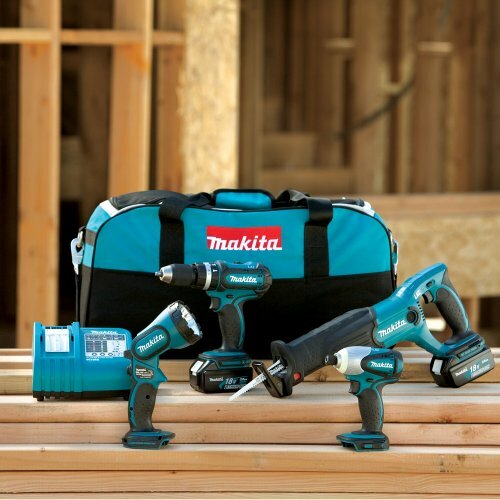 To supplement the tools in this kit, I also purchased the Makita 18V LXT Fluorescent/Incandescent Flashlight (BML184), 18V Makita Cordless LXT Lithium-Ion 6-1/2" Circular Saw (BSS610Z), and Makita 18V LXT Lithium-Ion Cordless Jig Saw (BJV180Z). Overall, I'm very happy with the Makita LXT series tools and would recommend it for home or professional use. The new kit came and I noticed the forward/reverse switch has been lightened up on the lithium models. Also, the motor doesn't sound as heavy duty. Then yesterday the drill "popped", got really hot, and quit working. Fortunately I still have my 12 volt NiCad, so I could finish the barn roof with it. Amazon.com is sending me a whole new kit, I'm supposed to remove the BTD141 Impact drill, and put the faulty one back in, and send the kit back. I hope that's not the sort of kit I received the first time. The sawzall is nice, especially the blade insertion/removal lock. I've used it to rip a 7' 2x4, and feel there would have been battery power left to rip another one. The tool feels heavy and stout. The hammer/drill/driver has a nice LED feature like the impact drills, but the forward/reverse switch on it seems too light also. The flashlight is typical, nothing exceptional, but not flimsy either. Don't pay over $383, and I've even seen them delivered for $320 after I bought mine. I have had these tools since christmas. So far so good. Really bright light on flashlight. Nice LED's on the drills. Good quality Materials used in all products even the bag. Batteries charge as quick as advertised.